Residents say the fire alarm system didn't work and allege there are code violations at the John Hancock Building in Chicago. 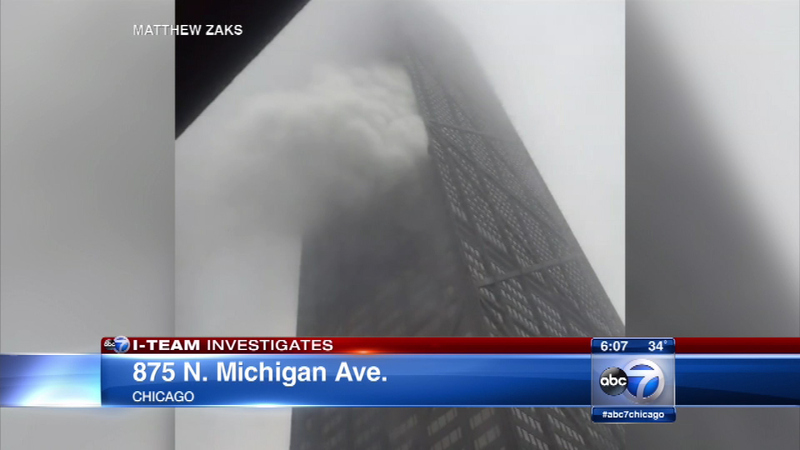 CHICAGO (WLS) -- Following a weekend fire on the 50th floor of the John Hancock, some residents are questioning the building's safety. When flames lapped the windows halfway up the Hancock, residents were scared and witnesses didn't know if something sinister caused it. The incident has heightened safety concerns even though we know it was an accident started by a candle in a bedroom. But some Hancock residents say the fire alarm system didn't work and that the incident has revealed other flaws in the building's emergency plan. The voice alert notification system that Hancock residents were supposed to hear in an emergency, they apparently didn't on Saturday. John Whapham, a neurosurgeon who lives on the 63rd floor, told the I-Team Monday that there are serious issues with the fire evacuation system evident during the weekend fire. "Not a single alarm, not a single announcement anywhere, nor did the expensive alarms that we spent the last year and a half putting in go off, nothing. Nothing on my whole floor," Dr. Whapham said. Non-working fire notification systems are code violations. Fire officials say everything worked fine, but Dr. Whapham says it didn't. Five people were hurt during the incident, though not seriously. And while the fire was put out quickly, Chicago Fire Department officials had to call in extra manpower to help residents who found themselves trapped in smoky stairwells. "Absolutely chaos today up on these upper floors that are above the area where the smoke was sucked up to the upper floors," Dr. Whapham said. "People really, at least on my floor, were running around. No one had any idea how to get out when they were trapped and couldn't get down." The 100-story Hancock was finished in 1969, long before sprinkler systems were required in high-rise buildings. "If they had the sprinklers in there, one sprinkler would have put out the fire while the fire was still small and everyone would have been safer and no glass would have broke," said Tom Lia, executive director, Northern Illinois Fire Sprinkler Advisory Board. Lia is a former suburban fire marshal who says that without sprinklers, residents of the 700 Hancock condos depend on voice alert systems - and when those don't work, they're out of luck. Lia says the Hancock could be retrofitted with sprinklers. "The John Hancock has a tremendous water supply inside. They have large reservoirs of water, they have a stand pipe system, they have a fire pump system, they have an underground water system. They have everything necessary to put the sprinklers in, I'm not sure why they didn't do that," Lia said.